Main Lite Electric Company, Inc. - The foremost qualified outside electrical contractor in northeast Ohio. The story of Main Lite began in 1988 under the vision of JeNell and Frank Massuri. 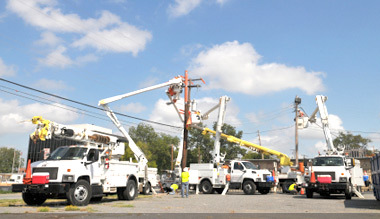 Beginning as a small family owned contractor located in Niles, Ohio: Main Lite quickly built its reputation for excellence in the specialized outside electrical fields of traffic signals and overhead line work. Throughout the years of rapid company growth, Main Lite Electric built upon the vision of its predecessors, with a goal driven focus on safety and quality workmanship. While remaining a SBA certified woman owned company, Main Lite has expanded its operations with a diverse professional staff that has earned respect in the industry, and achieved several safety awards and performance acknowledgements. With its headquarters in Warren, Ohio, Main Lite now operates with its IBEW union workforce throughout the United States. The specialized fields of service performed by Main Lite Electric consist of the following... 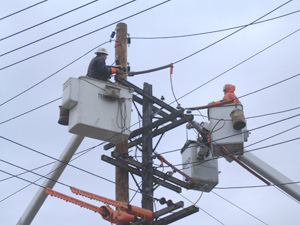 Overhead line construction, transmission and distribution maintenance, substation construction and maintenance, underground electrical construction and maintenance, emergency storm repair and restoration, traffic signal construction and maintenance, roadway lighting construction and maintenance, municipal radio fire alarm system services, and emergency warning siren services. As an electrical contractor (partnered with the International Brotherhood of Electrical Workers, National Electrical Contractors Association, and International Municipal Signal Association), Main Lite Electric Company has the resources and expertise needed to complete any project safely and on time. Please browse further into this website to discover how Main Lite Electric can serve you.